The Pacific 'Ring of Fire' has been angry over the past day, producing four strong earthquakes since yesterday afternoon. 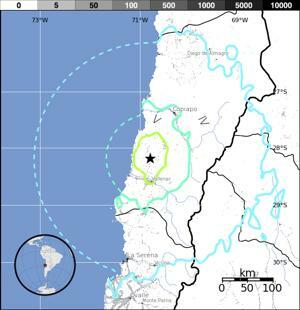 North-central Chile was the first to feel the Ring's wrath, as a magnitude 6.8 quake went off at about 3:15 p.m. EST, centred roughly 40 km north of Vallenar, the capital city of Chile's Huasco Province. Reports say that it shook buildings as far away as Santiago, nearly 600 kms to the south, and closer to the epicenter, some buildings in lower-income areas of Vallenar suffered collapsed walls. According to a Reuters report, one unfortunate woman died shortly after the quake, of an apparent heart attack. 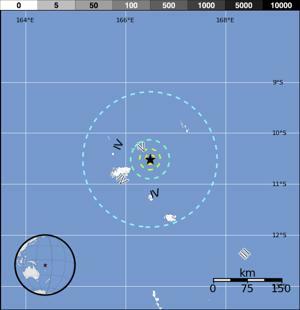 The Solomon Islands, in the south Pacific, were next, as two strong earthquakes, registering as magnitude 6.0 and 6.2 on the Richter Scale, struck just east of the island of Nuendö at 6:03 p.m. EST. 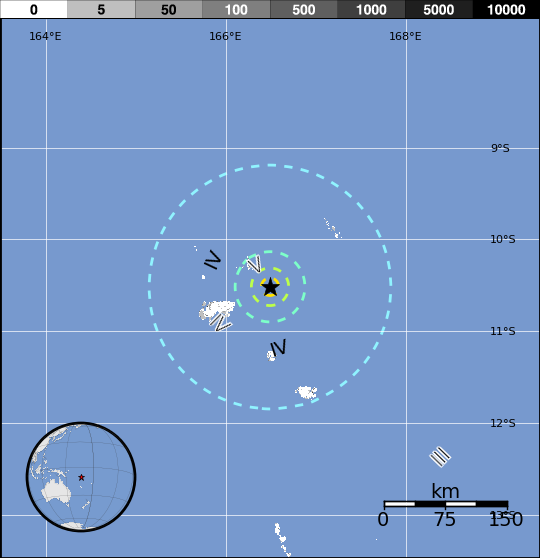 No reports of any damage or injuries from either of these earthquakes as of yet, however the area is sparsely populated, with Lata, a community of just over 550 residents at the northwestern end of Nuendö, being the closest settlement to the quake. Finally, this morning, at 4:53 a.m. EST, a magnitude 6.0 earthquake shook an already battered region along the southern tip of Alaska. 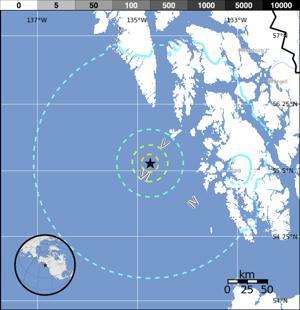 The Alaskan Earthquake Center is apparently reporting that today's tremor is an aftershock of the magnitude 7.5 quake that shook this same area on January 5th, and it is just north of where a magnitude 7.7 earthquake shook Haida Gwaii (the Queen Charlotte Islands) in October of last year. No damage or injuries have been reported from this latest quake. 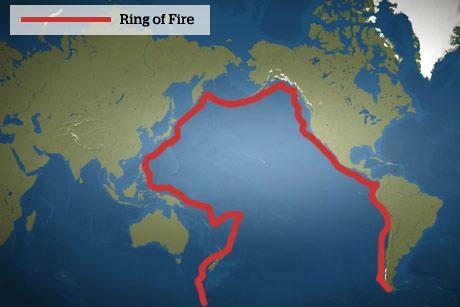 Although earthquakes around the 'Ring of Fire' have been known to touch off tsunamis, no alerts were sounded as a result of any of these four events. These earthquakes occurring in relatively quick succession, separated by distances of thousands of kilometres, punctuates just how active the 'Ring of Fire' is and just how unpredictable it can be. Although efforts are being made to put early warning systems into place, true earthquake prediction remains a lofty goal.